Los Angeles (TADIAS) – The famous Ethiopian fossil Lucy (Dinkenesh) will soon end her controversial six-year tour of the United States, making her last public stop at The Bowers Museum in Santa Ana, California where she is on display through April 28th before heading back to Ethiopia later this Spring. 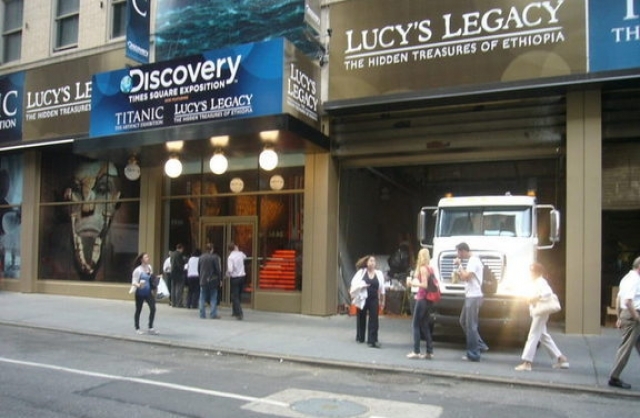 The 3.2 million years old Lucy was rushed out of Ethiopia in the summer of 2007 under a cloud of controversy over the ancient fossil’s safety and the financial motive behind Ethiopia’s Ministry of Culture and Tourism’s decision to approve the tour in exchange for millions of dollars despite reservations by experts. The famous bones were shunned among others by The Smithsonian Institution’s National Museum of Natural History in Washington, D.C., which refused to display the fossil citing concerns that the remains were too fragile for touring and travel. At the time authorities had hoped the exhibition would enhance the country’s image abroad. “Ethiopia has an image problem,” Gezahgen Kebede, the honorary consul general at the Ethiopian Consulate in Houston and one of the leading proponents of bringing Lucy to the United States had told The New York Times. “The bigger thing in my opinion is to teach people about Ethiopia,” he said. In between the controversy, Lucy was electronically scanned by researchers at The University of Texas at Austin, in collaboration with the Ethiopian government, and the first digital image of the world’s most famous human ancestor was created in the University’s High-resolution X-ray CT Facility. Click here for a closer look at the California exhibit.